It is with great pleasure and anticipation that we, Christina and I, welcome you once again to our friendly challenge. 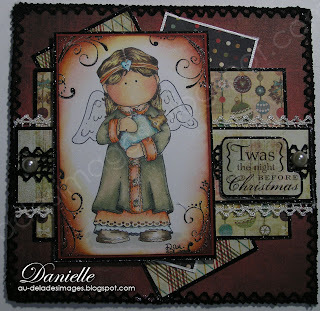 This week, lace is our target inventory item, and is there a better way to use up paper than creating layers? I was brave this week, I resisted buying beautiful new papers after making two stops en route to Cornwall for a scrapbooking weekend... Since I had fidelity cards to use up, I chose to add shades to my red and yellow COPIC palette, and I as a greedy consumer of embossing powder, I was more than happy to find a huge bottle of the stuff from Ranger! Before we took this challege, I had ordered a special paper palette from Creative Memories, that I received this weekend; however, I still have not opened it, as to remain faithfull to my challenge, I'll use up my opened stuff before I touch it... Now, back to our chalenge and my project. I chose this sweet Hanglar image to take me along my adventure and the beautiful Jovial Paper pad from Basic Greay , both gifts from a dear friend. 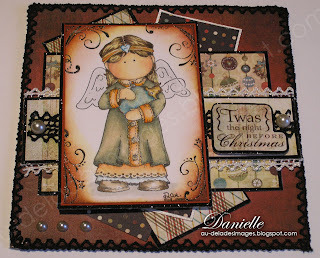 I love to twin the vintage look of the Hanglar little sweetie with this paper. 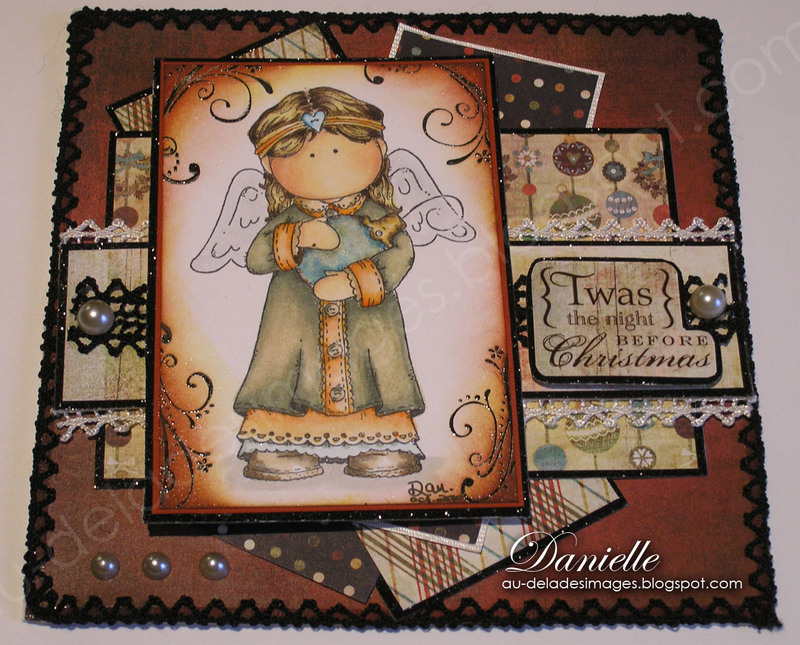 Since Christmas is at our door, I decided to add a bit of glitter to my card with the gorgeous Twilight paper. The lace comes from my grandmother's secret box! Thank you for stopping by my blog, your encouragements and comments means so much to me. If you should feel like joining us for this fun challenge, please get in touch with Christina or myself. This week we have the pleasure in welcoming Charlene and Rene with us. 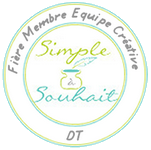 Je suis désolée, je n'avais pas eu la chance d'écrire la version française de mon petit texte. Chaque vendredi, ma bonne amie Christina et moi , nous concoctons un petit défi maison visant à utiliser notre inventaire! L'aspect le plus difficile de ce défi est le fait qu'il faille résister à tout achat de nouveauté, en excluant les Copic, les Magnolia et tout autre outil nécessaire. Croyez moi, ce n'est pas simple de résister aux nouveaux papiers! Le thème de ce défi est Dentelles et "layers" (couche? étage?). J'ai choisi une image Hanglar, que j'affectionne particulièrement. Je l'ai mariée à cette palette Jovial, ayant un look un peu "vieillot", qui convient si bien aux images Hanglar. J'ai colorié avec les Copics, ajouté la dentelle, et un peu de brillant et voilà! Merci de votre passage, j'apprécie vos nombreux commentaires, comme du bonbon! Love it, you colored this image to perfection. J'aime beaucoup les tons choisis pour la colorisation ainsi que les volutes embossées, cela fait une image beaucoup moins statique. 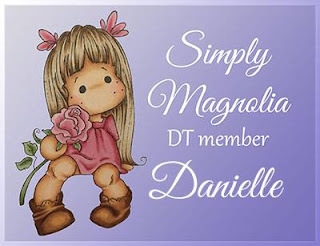 Danielle, this is a work of art, my friend!!!!! Your coloring of this sweet image is sheer perfection. Love the layers and lace. You totally aced this challenge. 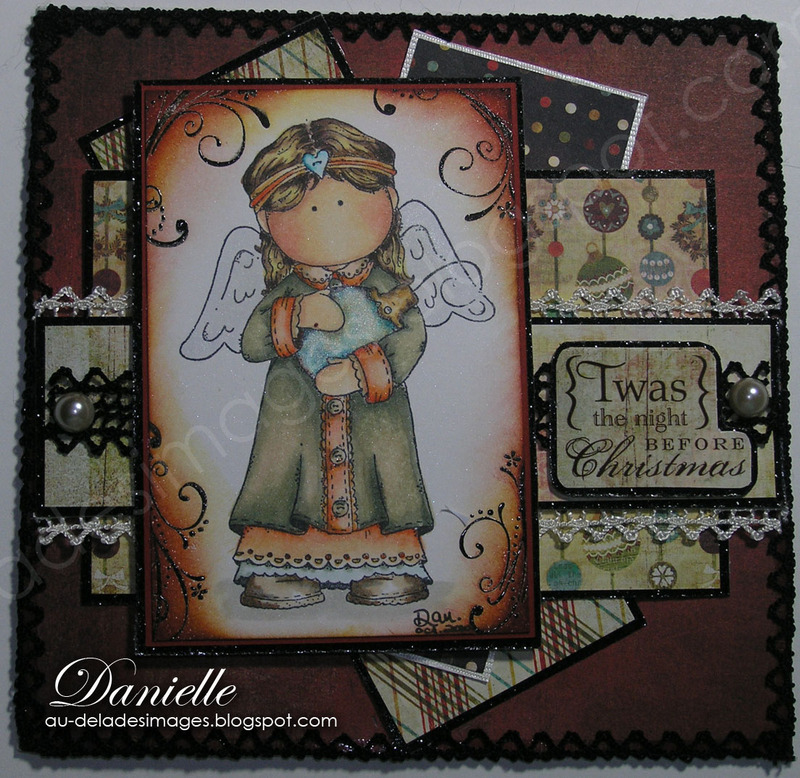 Danielle this card is just over the top ! You are so creative and your coloring is just awesome. I love the image, the papers everything about it...did you need my addy ? Oh Danielle! This may be my favorite card of yours ever!!! It is so beautiful and everything goes so perfectly together! This is fabulous, I love it! This image is just awesome...I so wish I could get my hands on some of those Hanglar's! Don't think I've seen this one b4 and you've colored it beautifully, well done! TFS! Such a pretty card! I love the richness of the colors. Very nicely done! J'adore ta carte elle est superbe! j'adore le mélange des couleurs et le traitement de ton image, bravo!